Growing from a single day Miami-based festival into a global company and the biggest live brand in rap music, Rolling Loud’s success embodies the spirit of Hip-Hop. 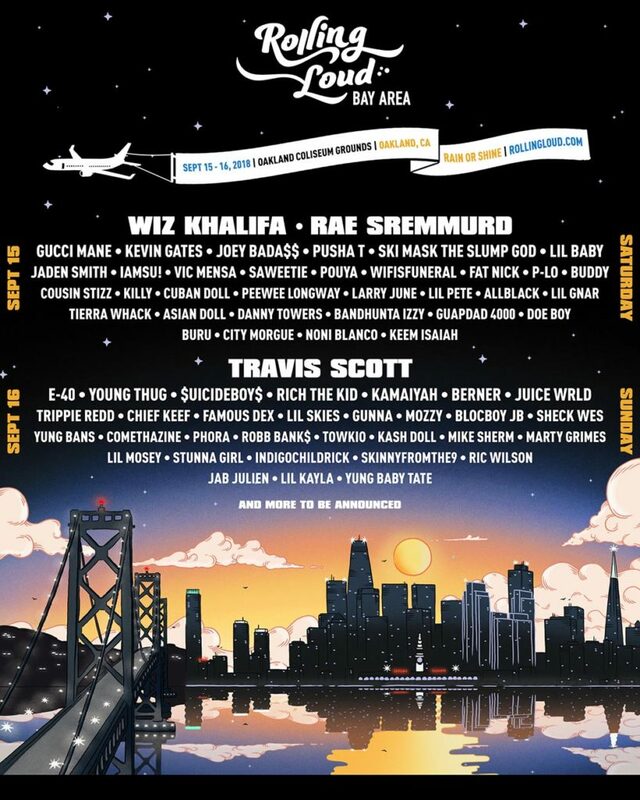 Gathering a variety of rap’s biggest names for a two day bash, Rolling Loud is proud to announce the lineup for Rolling Loud Bay Area 2018, headlined by turn-up titan Travis Scott and Taylor Gang ringleader Wiz Khalifa. As is tradition with Rolling Loud festival lineups, the artist roster for Rolling Loud Bay Area is as star-studded as they come, boasting Hip-Hop heavy hitters like Rae Sremmurd, Pusha T, Gucci Mane, and Kevin Gates, local heroes like rap legend E-40, IAMSU!, Kamaiyah, Mozzy, and P-Lo, XXL Freshmen Trippie Redd, wifisfuneral and BlocBoy JB, and other rapidly rising stars, including Juice WRLD, Lil Baby, Rich The Kid, Yung Bans, Lil Skies, and Saweetie. Occurring over two days on the grounds of Oakland Coliseum, Rolling Loud Bay Area brings the blast of hyphy local energy that the rap game desperately needs. Tickets will be available for the festival, happening September 15th and 16th in Oakland, on Friday 7/20 at noon, PST. For a window of 24 hours, the tickets will be available at a discounted price of $179.99. A convenient payment plan is also available for fans who would like to pay in installments. On Friday, tickets for Rolling Loud Bay Area 2018 will be available exclusively at: www.rollingloud.com. Featuring a three day lineup and moving from Bayfront Park to Hard Rock Stadium, Rolling Loud Miami proved that bigger is better in 2018. With over 140 artists performing during an action-packed weekend, Rolling Loud Miami 2018 brought capacity crowds each day to the Hard Rock Stadium in Miami Gardens earlier this month. Headlined by J. Cole, Travis Scott & Future, Rolling Loud 2018 boasted performances from heavy-hitters like Migos and Lil Uzi Vert, veterans like N*E*R*D, The Diplomats and Juicy J, established names such as Young Thug, Big K.R.I.T., Young Dolph and Rick Ross, and risers like Playboi Carti, Lil Skies, Ski Mask The Slump God, Trippie Redd and many more. Founded by Matt Zingler and Tariq Cherif, recently the subject of a feature in the Wall Street Journal, Rolling Loud continues to expand its profile as one of the most successful and valuable festival brands in the music business. Rolling Loud Festival is one of rap’s premier music festival experiences. The festival was the brainchild of co-founders Tariq Cherif and Matthew Zingler, who began organizing shows in 2010. The two created Rolling Loud Festival in 2015 as a one-day festival for 6,000 attendees. Four years later, the festival’s Miami chapter has expanded into a successful three-day event, with the festival expanding worldwide, arriving in Southern California and the Bay Area in 2017, and reaching Tokyo in 2018. Stay tuned for Rolling Loud Bay Area 2018, occurring on September 15-16 at Oakland Coliseum in Oakland, CA. This entry was posted in Uncategorized on July 23, 2018 .